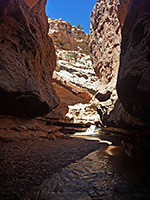 Slot canyons look prettier if a permanent stream is flowing, though the increased erosive power of year-round water tends to widen the passageways, and outside of Zion National Park there are few such drainages. 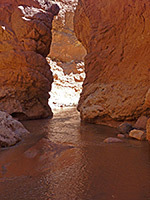 But one good watery gorge is found close to the main road (UT 24) through Capitol Reef National Park, where for one mile the deep canyon of Sulphur Creek contains a beautiful narrows section with waterfalls, deep pools and overhanging, subway-like channels, cutting through layered, orange-red sandstone. 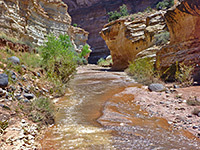 At most times of year the few obstacles in the narrows are easily bypassed by a little scrambling and wading, and most of the 5.3 mile hike in the canyon is along sandbanks or terraces beside the creek. The hike starts from the Chimney Rock trailhead, descending a shallow side canyon to the stream, and ends when the creek passes the national park visitor center 3 miles further east along Hwy 24; trip is completed by walking back along the road, using a car shuttle, or hitching a lift. Flash flood danger along Sulphur Creek is quite low, as the gorge is confined only for short distances, and in most locations it is easy to climb to higher ground if necessary. 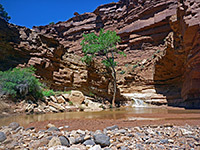 The water in the canyon is usually clear, fast flowing and just a few inches deep, apart from some of the pools which have depths of several feet. Topographic map of Sulphur Creek. 23 views of Sulphur Creek; gallery, slideshow. Scenes in the canyon (mp4; 1:05 min; 17 mb). The Sulphur Creek hike is well enough known to have an NPS sign ('Visitor Center, 5 miles') at the entrance to the side ravine used to reach the main canyon. This location is directly opposite the parking area for the Chimney Rock Trail, 3 miles (by road) west of the park headquarters and 4 miles from the western park boundary. A profusion of footprints along the ravine suggest the hike is quite popular - the route follows the sandy floor of the drainage as it twists and turns through the dark brown, ledgy rock of the Moenkopi Formation, deepening slowly with just one minor dryfall, and joining the creek in a rather wide part of its canyon, here about 250 feet deep. The gorge stays relatively wide for 1.5 miles downstream though it deepens steadily, and by the time it passes under the Goosenecks Viewpoint (reached by a side road off UT 24), the cliffs are 600 feet tall, and fairly sheer. At ground level, some parts of the gorge are bordered by smooth, curving cliff faces, along which the water flows, though most places are sandy and bushy. 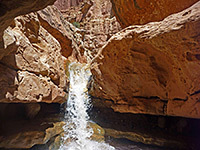 The enclosed, slot-like section is reached about half way along the canyon, and starts quite abruptly with a fall of 10 feet into a deep pool preceding a cave-like channel where the water has carved sideways into a soft layer, beneath still intact strata above. The falls are bypassed by climbing down ledges on the right side, after which is a nice sequence of cascades and narrows, including a second, slightly higher waterfall, also passed on the right. 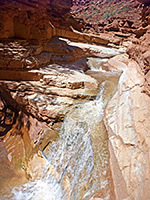 The slot gradually opens out until one final falls, leading to the biggest pool on the creek. This one is passed on the left. The visitor center is then 1.7 miles further, as the cliffs become quickly less high - the sandstone strata in this area of the national park, west of Capitol Reef, have a convex arrangement, with the slot-forming Coconino sandstone exposed only in the middle, deepest part of the gorge, and the softer, Moenkopi Formation enclosing the streamway to the east and west. 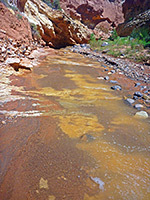 Although many of the rocks are yellowish in color, the canyon is named on account of the slightly sulphurous nature of the water.